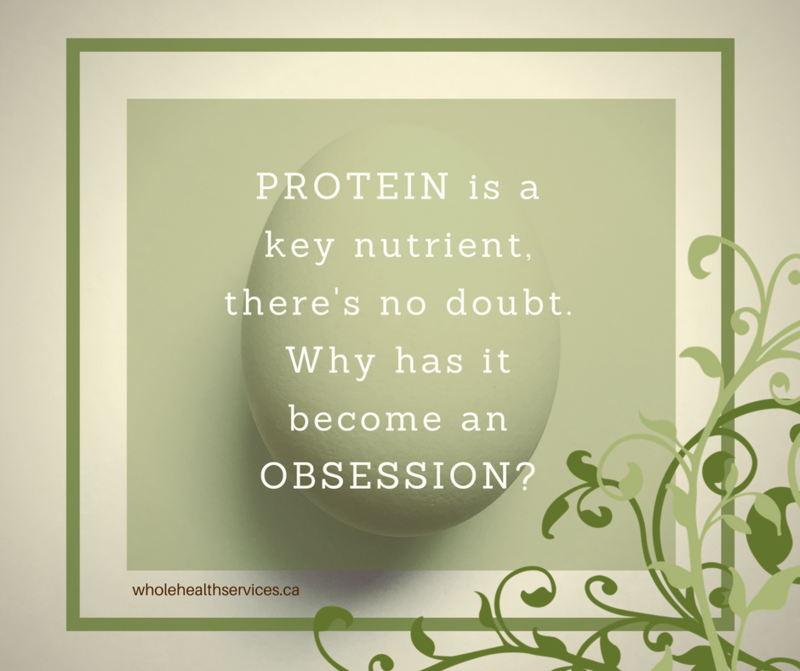 Why do we have a protein obsession these days? Ask anyone trying to lose weight or gain muscle or recover from illness, or really anyone striving to eat right, and the question of protein amounts & sources inevitably comes up. In a time when our focus on food choices has reached a religious fervour, protein leads the current caravan of nutrition to the promised land. How is it that we’ve come to view lots of protein (to the exclusion of other macronutrients) as synonymous with health? Two ways: timing and our personal focus at this time. Nutritional science of the 70s, 80s & 90s drove us to an unrelenting fear of fat. First saturated fat, then fat in general, were (falsely) proven to be the source of heart & weight problems in North America. The extreme version of this food fad found me on a practically fat-free diet after the birth of my 1st son – a situation that had a negative impact on my health for the next 20 years. Another circumstance underlines our heightened awareness of this nutrient. While carbohydrates fuel us with the energy to stand straight and function adequately through the day, and while fats ensure our constant warm temperature and a healthy nervous system, protein provides the actual structure and functionality of the body. The flesh and sinew that make up this tabernacle, this house for the soul, is all protein. Think of protein as the stones of the temple honouring your soul. Protein is the building block for muscle, yes. It’s also the structural material for all tissue in the body: skin, mucous membrane, nails & hair; cartilage, ligaments, tendons; even your bones & teeth. Protein is the molecule that differentiates plant from animal. Because of the structure, protein gives us (as animals) the freedom to roam the earth independently. And it’s protein that supplies the means by which we have the ability to carry out our life’s purpose, our work in the world. There are messengers keeping us in constant communication with the Self: hormones, neurotransmitters, antibodies. There are enzymes, the acolytes who quietly see to every minute chore within the temple. Freedom and location independence: as a society, these are the values we currently crave the most. No wonder we’re obsessed with protein! In a beautiful model of sustainability, the body recycles and reuses protein constantly, thereby keeping our daily intake needs to a minimum. Brilliant, when you think about it, having evolved from an ancestry of feast or famine, the body learned to make its most precious commodity last. Even when you eat right amount of protein for your age, gender, activity level (details in the 2nd post), how much of it are you absorbing and actually using? Before the peptidases (protein-digesting enzymes) can do their job, a protein needs to be denatured (uncoiled) by stomach acid. Not enough acid, and that protein stays pretty much intact through the rest of the digestive ride. The stomach lies at the heart of the 3rd chakra, the energy centre ruling your sense of self, your ability to stand up for yourself. Your Will. Digestion, in general, and specifically activities of the stomach are an act of will – an indication of how engaged you are with life, how well you digest life. In other words, you need a strong sense of self, at an emotional-soul level, in order to best access the building blocks for your physical body. The best way to solidify your Solar (3rd) Chakra is to ground more strongly into the lower two, root yourself into your own care & security. Improve your relationship with the earth, and you’ll improve your digestion. As we move into the new paradigm, an age in which the needs of the individual soul step forward as the guiding principle for how we live, it’s essential that the way we nourish the body supports that growth and movement. “The body is your sacred chance to be here” and, with the help of protein, follows the directives of your soul. These thought are great food for conversation. Get a good discussion going among your friends by using any (or all!) of the pretty green buttons. Then come to the Eating Better Conversation group to mull it over with me. This entry was posted in Creating Health from the Inside Out, Soul Bites and tagged foundations of health, healthy food choices, magic looking glass for eating, nourish your body, protein, purpose, spiritual practice in the every day by Cathy Cochrane. Bookmark the permalink. I agree with you totally. I am all about the mind body connection. I believe our bodies are our homes for our souls whilst in this human life form in earth. If we imagine our bodies this way I believe we will want to take better care of them. I have a question for you – can you simply explain to me how when the liver is overloaded by sugar it does not send the message to the brain that we are full so we then keep eating, hence, obesity etc – I think this is a fabulous way to understand how our bodies and minds are dis connected physiologically due to the sugar overload. Great question, Deb. The uber-quick physiological answer has to do with feedback mechanisms – the way our body balances its millions of chemical reactions. Energetically, sugar is expansive – it literally takes us out of ourselves. In the extreme, that means your body needs to overcompensate to try to ground you back in. I do believe this may need a post of its own to explore more fully. I loved this post! Oh, please write more . . . I for one, am someone who needs a lot of protein. I feel better when I eat it… more whole, more my self, more grounded. I love seeing someone write about the spiritual side of this . . . it’s time people took this in too.. Bravo! More! More! Thanks, Elizabeth! I agree that we need to consider the energetic aspects of what our foods are doing to us…and to our planet. More in 10 days: the nitty-gritty details! I think eating, cooking and assimilating food is a mindful, spiritual act and if things like out chakras are out of balance, it all gets affected. Good post! Now that is food for thought, I did not know the body recycles protein. But I do know that most people eat too much protein. I choose to eat what feels right for my body: No grains, fish and lots of fruits and vegetables. Thanks for the post Cathy! Completely agree, too many people believe protein causes fat, I believe a little of everything is the way to go towards a balanced diet! And you used my favourite saying! “We are not human beings having a spiritual experience. We are spiritual beings having a human experience.” Love it. When I was a teenager, it would drive me nuts when my mother would tell me, “Everything in moderation.” Wiser words she could not have spoken. I love your portrayal of protein, a lot of people don’t realize the actual function of protein and also liked that you mentioned the functions of the other macronutrients and their importance. I found your connection between the mind and body in the digestion of protein to be very interesting as well as I believe that the mind and body connection is often not addressed as it should be. Thank you for sharing this and I look forward to part 2! Brilliantly said Cathy. I started learning about the benefits of protein in my 50’s. I also believe our bodies must be aligned with our food and spirits to process it properly. Very conscious post, it really needs to be said. We need to unprogram ourselves from the 80’s and 90’s low fat cardio bunny mentality! Thanks! Ah yes, the cardio bunny: “4 more, 2 more, and…change!” Aligning with our food is what it’s all about – no matter what you’re eating (or not). Thanks, Dana. Thank you for this wonderful perspective on protein. I particularly like your comment, “think of protein as the stones of the temple honouring your soul.” This is a great reminder to choose food wisely. I look forward to part 2. I went many years eating low fat and hardly any protein. It makes me cringe to think the damage I was doing to my body. Now I am all about ggod fats and lean, grass fed protein. But I must confess being confused as to how much is too much. Thanks for this. We can only work with the knowledge we have in the moment. I, too, cringe at some of the ways I’ve eaten in the past – or wonder how we ever made it out of the 70s in one piece. Thank the Goddess the body’s so resilient! “Digestion, in general, and specifically activities of the stomach are an act of will – an indication of how engaged you are with life, how well you digest life.” yes, cathy. i often relate and equate these two – digesting food and digesting life – with my clients who have long hard struggles with food and eating. I can imagine that piece is huge for your clients – how lucky they are to have you guide them on a gentle approach to both.